Exhibition opening: Urban Bee Homes since Plečnik to this Day and discussion on urban beekeeping • BTC d.d. The photography exhibition “Urban Bee Homes since Plečnik to this Day” is part of the project for encouraging urban beekeeping “Help the City Bee – Plant Flowers across the City”, which is organised by the City Municipality of Ljubljana and the BTC Company along with its partners for the fourth consecutive year. Beekeepers with more than 4,500 bee families in Ljubljana municipality represent as much as three percent of all Slovenian beekeepers. 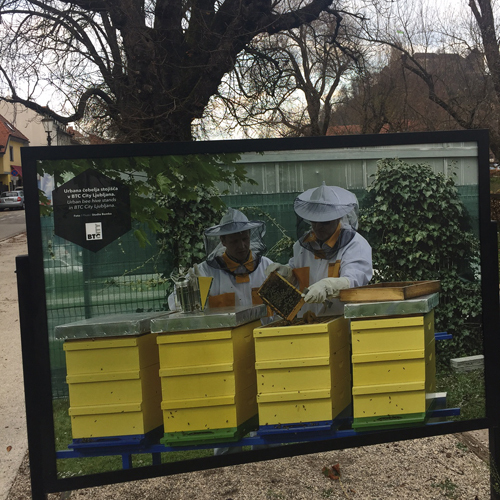 Under the auspices of the project and in the scope of the European Green Capital 2016, Ljubljana established the so-called Bee Path, a part of which is also the mentioned exhibition. The exhibition is a tribute to the Slovenian architect Jože Plečnik for his contribution in the field of urban beehive design and the design of candlesticks and candles. Needless to say, he also had a beehive in his backyard. A special place in the exhibition is given to photographs by Žiga Koritnik, who managed to capture different urban bee homes with his camera: beehives on top of Cankarjev dom, in the Centre of Urban Culture Kino Šiška, in the Cultural Centre Španski borci, on top of Hotel Park, as well as beehive stands in Park Tivoli and beehives on top of the Government of the Republic of Slovenia building. The exhibition also includes a “teaching beehive” by the Beekeepers Society ČD Barje, a beehive by Lekarna Ljubljana, the city beehive in the Botanical Garden of the University of Ljubljana and a beehive located in a private backyard in Bežigrad district in Ljubljana. The business centre ABC Hub in BTC City Ljubljana has on November 29 2017 in the scope of the project “Help the City Bee – Plant Flowers across the City” hosted an expert discussion on the challenges and opportunities of urban beekeeping. The discussion is organised by the society Medtem and the society Urbani čebelar, with the support of the City Municipality of Ljubljana and the BTC Company. The discussion will see experts talking about the meaning of expert knowledge in fighting diseases in bees and about the opportunities given by urban beekeeping in the field of tourism development. Good practices from abroad will be presented, including the Croatian case of connecting a disability to beekeeping and the illustration of the role of bees in modern art from Austria. The BTC Company carries out its project “Help the City Bee – Plant Flowers across the City” in the scope of its sustainability efforts within Business Unit Mission: Green. In cooperation with the City Municipality of Ljubljana and with the support of our partners, the BTC Company has supported urban beekeeping for the fourth consecutive year and has thereby raised awareness about the importance of preserving the Carniolan honey bee and about the significance of bees for the environment. Taking part in this year’s project are partners and representatives of the Bee Path: Medex, Merkur, Hofer, Semenarna Ljubljana with garden centres Kalia, and Minicity Ljubljana. Project’s partners call upon the inhabitants of Ljubljana to plant honey flowers and plants on their balconies and windowsills and thereby contribute to better pasture possibilities for urban bees in the city and to a better image of Ljubljana. Besides annual distribution of seeds and saplings of honey plants, this year, the partners for the first time called upon urban beekeepers to open the doors of their beehives to the broader public. At the open day event in the spring, the visitors were able to peek into numerous beehives, including the BTC’s beehive, which is home to four bee families and is located on the meadow along Atlantis Water Park in BTC City Ljubljana. The development of urban beekeeping goes hand in hand with the efforts for the greenification of cities, the encouragement of a healthy lifestyle and the desire for self-sufficiency and preserving contact with the environment. With these activities, the social awareness about the importance of bees for the preservation of the ecosystem and for life is continuously strengthened.